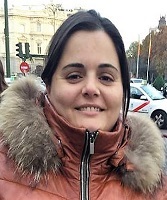 Ana Sofia Saldanha, professional translator, university lecturer in Universidade Autónoma de Lisboa (Portugal) in a Post-Graduation in Translation and Probono Mentor in the Portuguese Translators` Association (APTRAD). She has been interested in Mentoring since 2015 as it is a very good tool for future-to-be-translators to start a career in Translation. She is interested in the Mentoring theme and has been delivering communications around the world regarding this theme.